The damage can happen when the heel unit is subjected to forces in a particular way. This particular arrangement of forces is pretty rare. 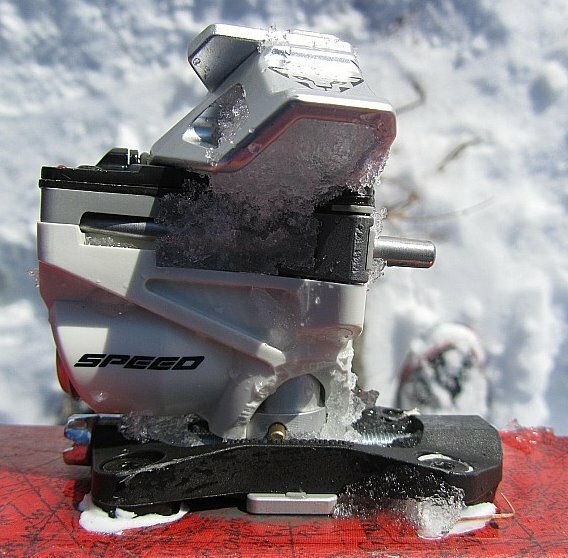 In the ascent mode (when the heel unit is in “lock” or “tour” position) the housing may be damaged if the unit is strongly impacted in a counter-clockwise direction (back towards “ski mode”) causing the internal PIN to strongly impact against the internal housing wall. Damage can only occur in ascent mode, not in the descent (or “ski” mode). Even if the housing is damaged, the binding should still release perfectly in any mode, and there is little danger of the heel unit detaching. Therefore this does not constitute an acute danger or risk for the skier. Essentially after the damage, the binding functions similar to a TLT Vertical binding which doesn’t have a PIN in the back unit (this “lock position” was introduced to prevent the inconvenient – and fairly rare – rotation of the heel unit back into ski mode, while touring). Actually the problem it is trying to solve, the return to ski mode when climbing, is a serious PITA. These rotations happen most often when breaking trail, rare if you are a track sucker I suppose? I think they occur due to snow build up under the heel, the boot then rotates the binding. I think getting the heel/boot clearance right is important though. Anyway Dynafit added a pin to the heel with a stop so the heel piece can no longer rotate, instead the brittle plastic can shatter instead, a 0.3% return rate since the start of the season according to Dyna sources. Which is not much, unless it happens to you. I’ve never been a huge fan of Dynafit’s plastic parts, I’ve had enough bits break and I’m not a fierce skier. Anyway if you have bought a Radical binding Dynafit will do some magic to cure this problem free of charge at your local dealer. The different positions on the heel piece are excellent on the Radical, an improvement on ease of use compared to the Speed. We will have to see how robust the system is. The toe piece is also a forged part and a great improvement on the old design. It is a pity they’ve had this glitch. Is very easy to install (two bolt included) and you need just to remove at all the pin and the spring. Hope you’ll find it interesting ! Well done that looks like quite a nice solution you’ve come up with. Here the one for the Radical-Speed (patented too). Little more “Radical...” and expensive, but is much light of the old base.